Choosing which school to attend is an important family decision. Why not allow us to provide you with the experience your child needs to make that decision the best it can be? Here at Notre Dame, we have a program that will allow your child to come spend a regular school day with one of our student ambassadors. By partnering up with them your child will "shadow" them on their daily schedule. They will audit their classes, meet their teachers, go to lunch with them and most importantly have that one-to-one peer time that provides the opportunity for questions to be asked and answered. To arrange a visitation day, parents should first obtain permission from your child’s present school. Parents should then call the Admissions Office at 315-749-7060 to set up a visitation day. Arrive at the main office between 7:50 and 8:00 a.m.
For boys, wear dress slacks, a shirt with collar, shoes and socks, and preferably a tie and/or sweater. For girls, wear a dress, or skirt/slacks with a shirt with a collar, a sweater or cardigan, if appropriate, and dress shoes. Dresses and skirts must be at least knee length. Jeans and/or sneakers are not allowed. Bring gym clothes (sneakers, t-shirt, shorts, and athletic socks). Arrange to be picked up at 1:55 p.m. Lunch is provided with the compliments of the school. 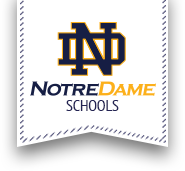 If you have any questions regarding admission to Notre Dame, please contact Jim Jones, Director of Admissions, at 315-749-7060.